I’m always looking for quick and easy dinners to make – especially on a Friday night when I’m usually pretty exhausted after a hectic week. Once the good weather rolls around, I also get a hankering for salad. 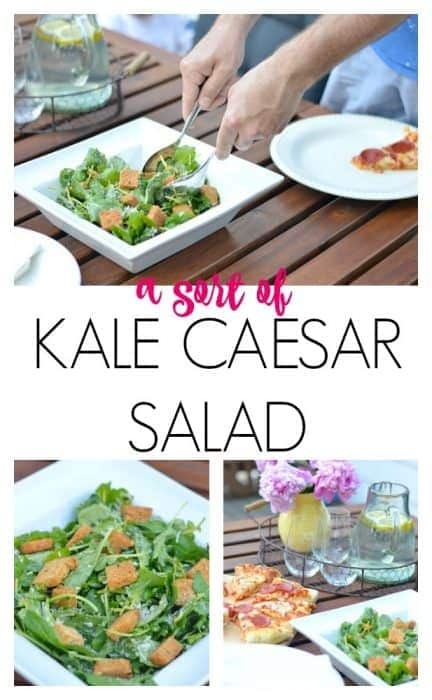 One of my favorites over the past few years has been this simple Kale Caesar Salad. I like to call it a “sort-of” kale caesar because the dressing is homemade and certainly not the calorie laden version you will buy in the store. It is just as delicious and takes only 2 minutes to whip up, though! Now a little bit of salad won’t keep me satisfied for long. Usually I will pair this with whatever I have on hand. That may mean adding some chicken, making some garlic bread or throwing a frozen pizza in the oven. You heard me, frozen pizza. I am a HUGE pizza snob and there’s only one frozen pizza that I will eat. And let me tell you, it is every bit as good as your local pizzeria. Maybe even better. I bet you’ve seen Freschetta pizzas in the supermarket and wondered if they were any good. Well, they are delicious! There’s also a huge selection to choose from. My personal favorite is the 5 Cheese Brick Oven variety but we also regularly get the Freschetta 4 Cheese Supreme and Pepperoni varieties. It’s very important to me that I feel good about what I feed my family. Freschetta pizzas are made with high quality ingredients. That means no chemical leaveners, 100% real cheese and sauce that’s made with 3 sun-ripened tomatoes. Paired with the healthy fresh – and not to mention simple – ingredients in the kale salad, you’ve got yourself a delicious dinner that will delight your family any night of the week. 2 large bunches of Lacinato Kale Dinosaur Kale, cleaned, stems removed and cut into bite sized pieces. Alternatively, baby kale is milder and can be bought prewashed in bags. Wash kale. Remove stems and cut into bite size pieces. Alternatively, empty bag of baby kale into a big bowl. Smash garlic and finely chop. Combine in a bowl with lemon juice, salt, red pepper and black pepper. Whisk to combine then slowly pour in olive oil to emulsify, all the time continuing to whisk. Add the dressing to the kale, making sure all the leaves are coated. Set aside. Crush approximately half of the croutons and add to the salad. Finally, add grated cheese and mix. Just before serving, add remaining whole croutons and shaved parmesan. 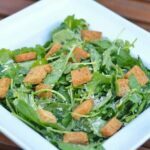 I like to use this recipe to make my own croutons from leftover bread. Anchovies are optional but delicious! Grab a Freschetta Pizza the next time you’re at Walmart and throw it in the freezer. You’ll have an easy dinner right at your finger tips the next time you need it! I’m telling you, the Brick Oven 5 Cheese is the only one I like the best and so many stores are not carrying it anymore, opting for the other varieties. Honestly, I get frustrated when there is no Brick Oven, it is the best and paired with your lovely salad would be heaven. OMG us too!! We buy multiples of the brick oven 5 cheese when it’s in stock! !